Today on Day 17 of our countdown, we have an autographed copy of The Soul Cages to giveaway to our lucky winner. Many fans tell us that The Soul Cages is their favourite Sting album - a mix of enduring songs, Northern folklore and the sound of Kathryn Tickell's signature Northumbrian Pipes seem to combine to provide a truly unforgettable album. Answer the following trivia question for the chance to win an autographed copy of Sting's album The Soul Cages! 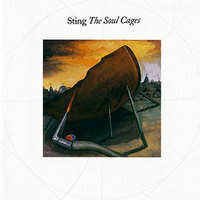 Trivia: Soul Cages - Sting dedicated 'The Soul Cages' album to three people - which three? Please submit your answer using the form below by 11AM/EST tomorrow. Each correct response will be entered into a drawing and winner will be selected, at random, and announced during the next day's post. This contest has now closed. The winner was Julie McFadden who correctly answered: Sting's father, John Dexter, and Ethyl Eichelberger.